and Herbert the Hippo are "Travelin' Light"! This is one CD you should not be without! grinning, and leave you laughing! it's entertaining for adults and children! Click the notes to hear an mp3 sample. Click the song title to see the lyrics. Click the CD cover to learn more. 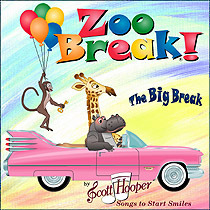 There's No Such Thing as Zoo Break! 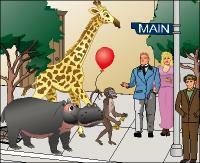 from the zoo, you get to go along. 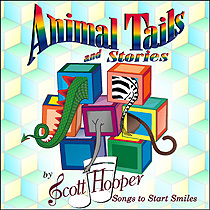 The greatest CD for children ever! Did You See the Giraffe? It's Great to Be Back in the Zoo! Click the illustration or book to learn more. Visting the zoo will never be the same again! the river to Hippo Hollow!